We can all use a little more magic in our lives. 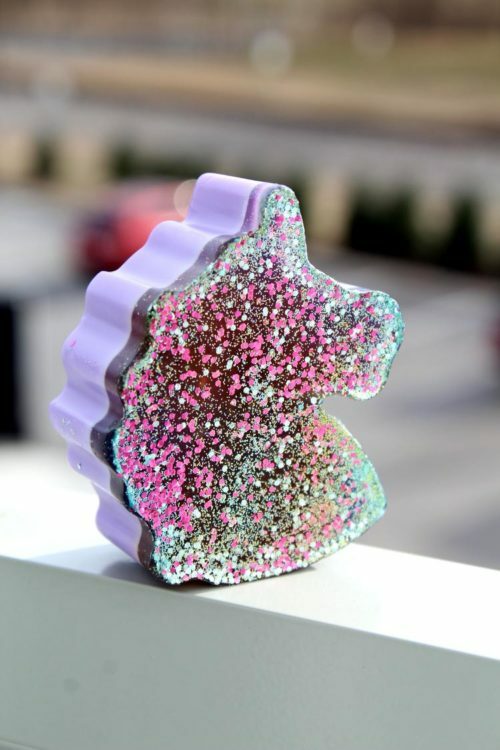 Bring some of that magic into your shower with this DIY glitter galaxy unicorn soap. 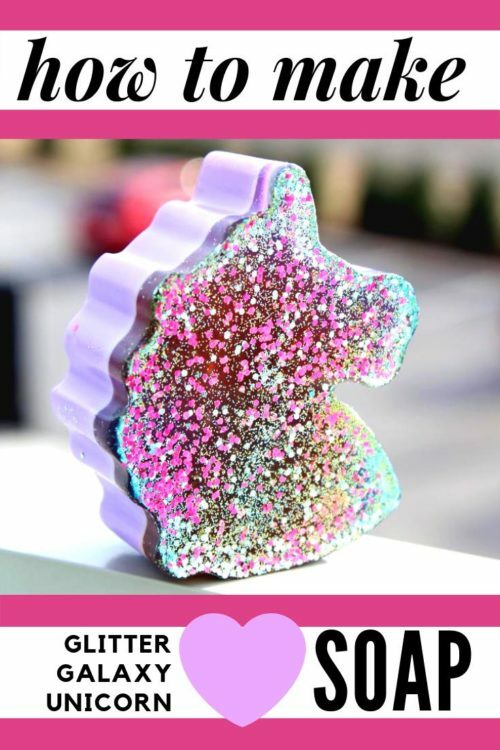 Made with a ridiculous amount of eco-glitter, this unicorn soap recipe offers a fun spin on galaxy soaps. 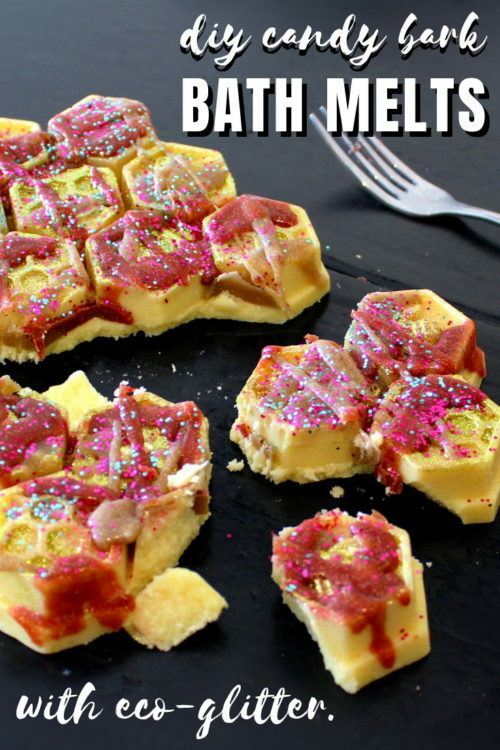 And, because it’s made using melt and pour soap base, anyone can tackle this project as a fun weekend DIY. Sometimes you don’t FEEL like a unicorn. It’s easy to forget sometimes, especially in times of emotional turmoil, that we are all magical creatures. Since sneaking into my forties, my life has been wrought with its fair share of chaos. Not only is this (middle?) age thing a tough pill to swallow, it’s also brought with it an array of unexpected side effects. Wrinkles, thinning skin, weight gain – and this crazy thing called perimenopause. Sadly, my mother’s need to always be pleasant and helpful resulted in FIFTEEN years of prescription hormone pills. (Made from horse urine, mind you.) That’s ten years longer than is recommended. Of course, her doctor assured her she’d be fine. She wasn’t. My mother ended up with cervical cancer. Luckily, surgery seemed to handle the unfortunate consequence of being over-prescribed hormones. Chemo, thankfully, was decided against due to the high probability of toxicity at her age. And later genetic testing put her at almost zero risk of developing other cancers later in life. The sheer fact, however, that my mother took a prescription to tamper her mood – up to the point it gave her cancer – has stuck with me. Are we, as women, not supposed to be angry? Because there are days I am outraged over so many things. And when women are angry, men say we’re crazy. But we aren’t crazy. We’re coping with life while there’s a war raging inside us. So, yes. I’ve had quite a few days, especially when those days are coupled with chronic pain, where I feel like I’m going mad. Some days I feel like giving up. I cry over songs and television shows. Other days I’m just pissed at the whole world. (And yes, my ex-husband in particular.) Days that I forget, yes, I am still as magical as a unicorn, even if I don’t feel like it. 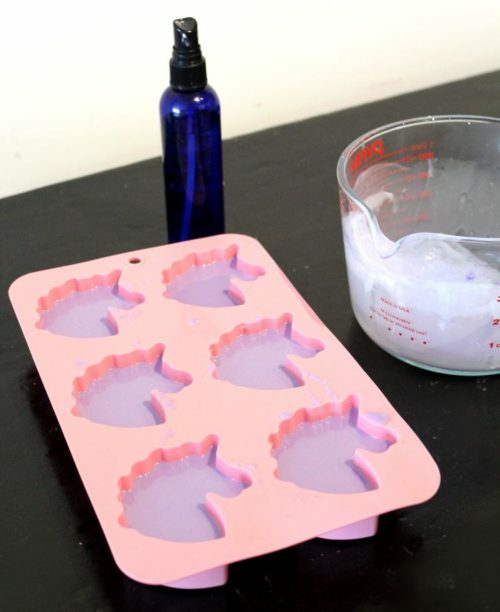 Now pour the melted soap base into each of the six cavities of your unicorn mold. (Each cavity should be around 3/4th of the way full.) Then spritz the top of the soap with isopropyl (rubbing) alcohol to remove any air bubbles. Set the mold aside and allow the soap to fully harden. 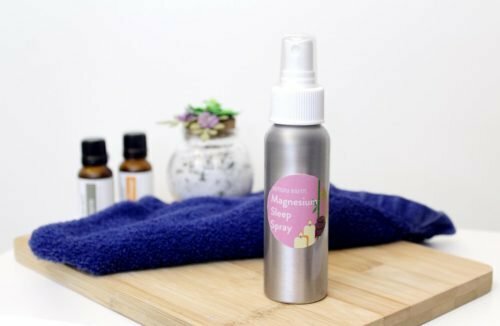 Once the base for your unicorn soap has set up, you’re ready to move on to the next step. Weigh out 5.7 oz. of clear melt and pour soap base. 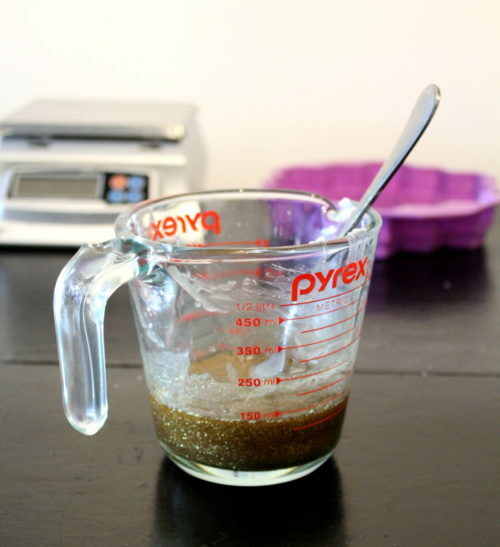 Cut into chunks, then combine in a glass Pyrex measuring cup. Heat the clear soap base in the same manner as the white soap base. Then, once melted, weigh out and stir in .05 oz. 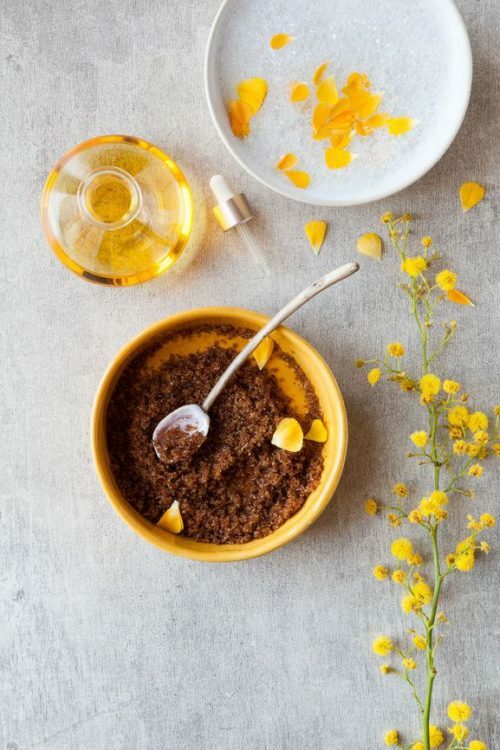 fragrance oil. Now dust spritz the top of the soap in your mold with isopropyl alcohol. Dust with glitter as desired. Spritz with alcohol once more, then gently pour about half of the clear melted soap base into the unicorn mold. 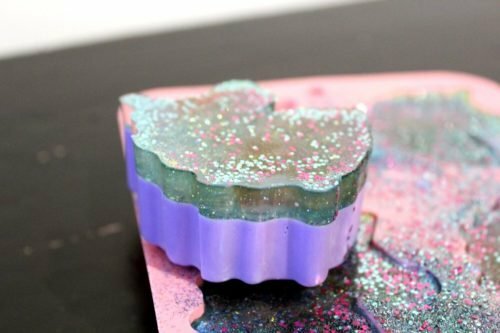 Dust the soap with additional glitter, then pour the rest of soap base into the mold. 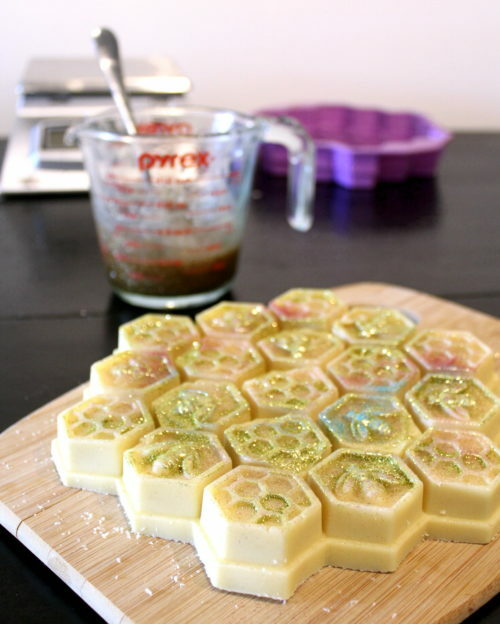 Spray the top of the soap with alcohol to remove any air bubbles. 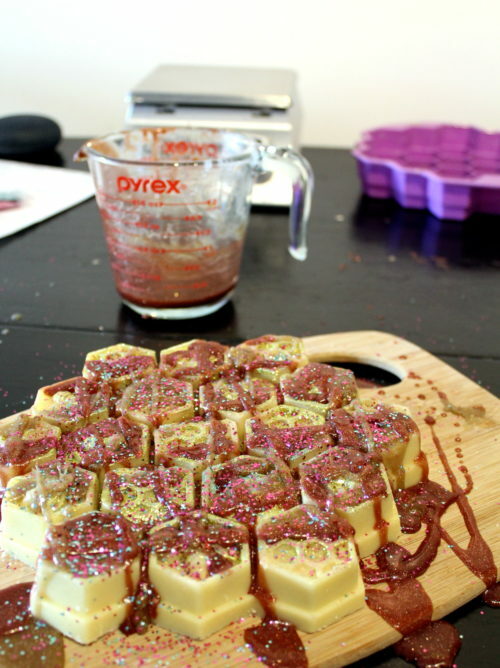 Next, use a utensil to lift the glitter up into the clear base as it cools to create a layering effect. While still fluid, spray the top of the unicorn soap once more with isopropyl alcohol. Then dust with a final layer of glitter. 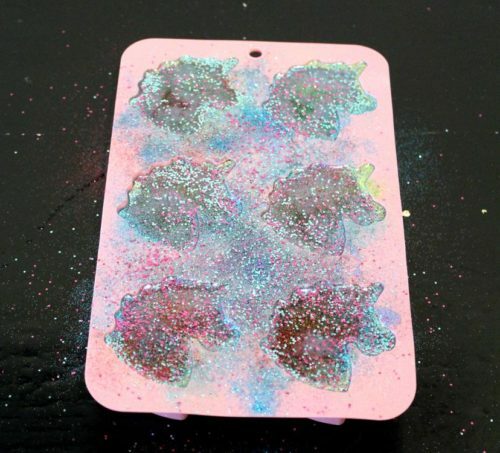 Once the glitter galaxy unicorn soaps have solidified fully, remove the soaps from the mold. 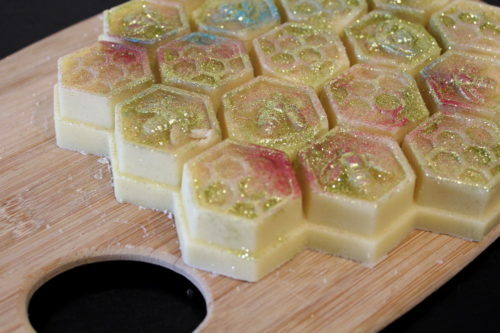 Then wrap each unicorn soap tightly in foodservice film until ready to use. 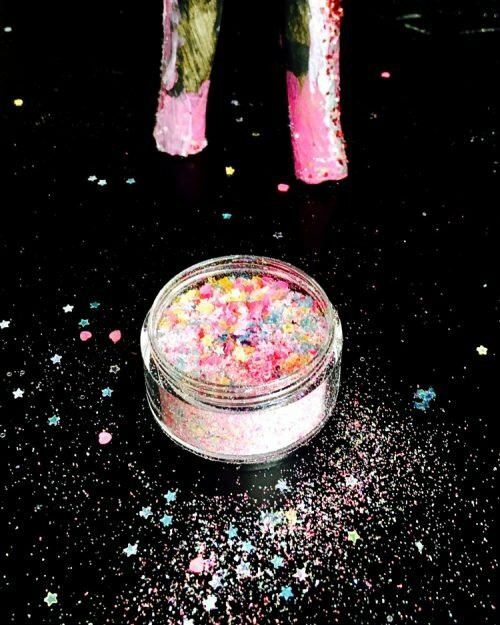 If you like my DIY glitter galaxy unicorn soap, then you may also like some of my other unicorn bath & beauty recipes. 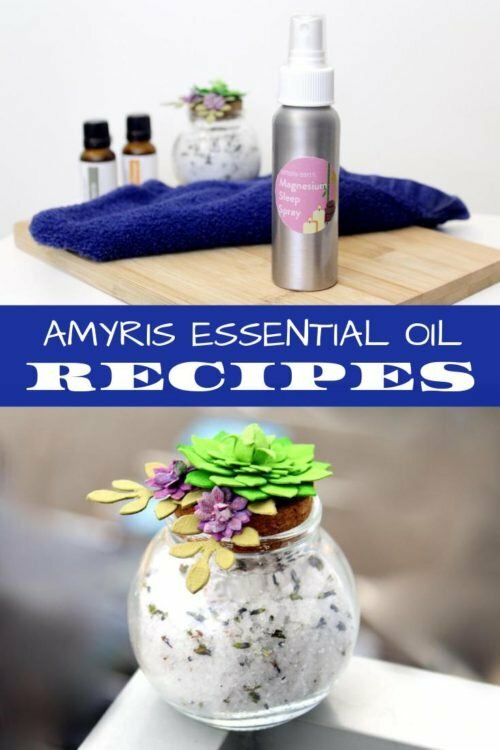 For more homemade soap recipes, as well as natural beauty and skin recipes, be sure to sign up for my semi-weekly email newsletter. You can also follow me on Pinterest, twitter, facebook and instagram. 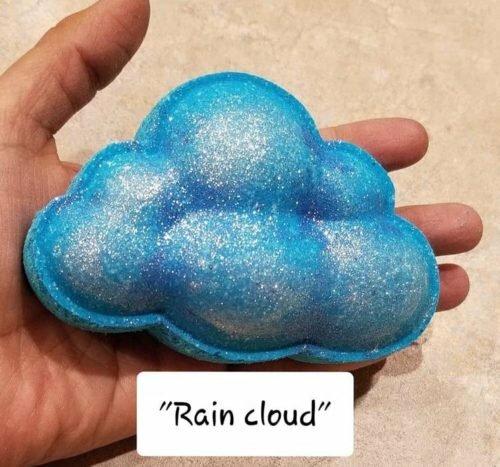 Have you ever wondered exactly how DIY-ers get their homemade bath bombs to explode with a rainbow of colors? 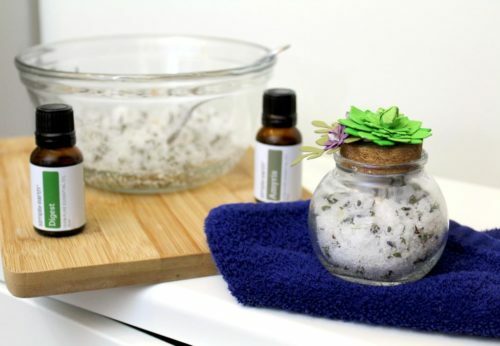 Ready to take your homemade bath bombs to the next step? 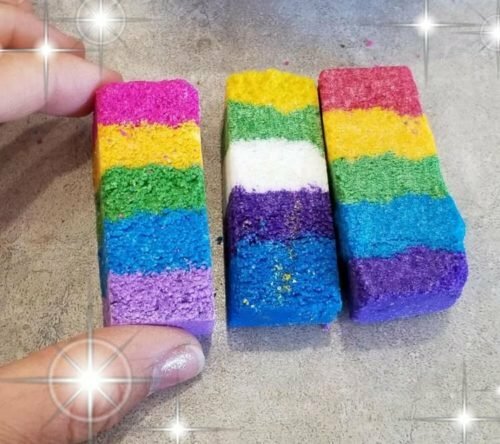 This tutorial walks you through the steps on how to make rainbow bar embeds for hidden rainbow bath bombs. 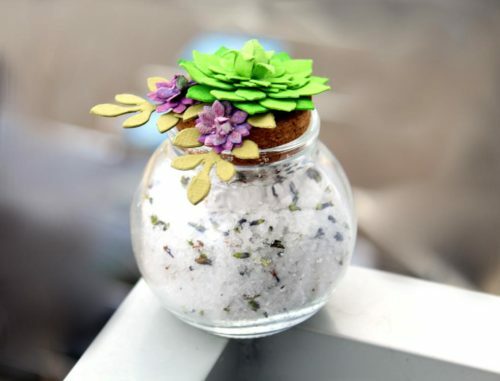 So you’ll be able to create the colorful, show worthy bath bombs you love! With the state of the current political climate here in Virginia – THREE scandals! How is that even possible? – I’ve turned to watching funny dog videos on the internet for comic relief. I also completely purged my friends list on facebook. A purge that seemed to be the best recourse, not just to escape unpleasant political events, but also to avoid the daily negativity, drama and downright mean comments people often leave. My friends list is now comprised of just ten people. Those who I am closest with and that mean the most to me. What remained after the purge however was a surprise. Suddenly I’m now seeing all the pages of inspirational small businesses that I’d forgotten about. 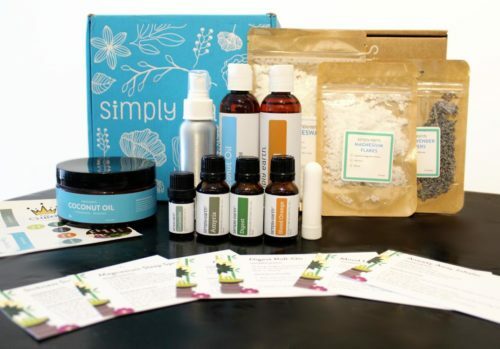 Along with a plethora of soapmaking groups that hadn’t shown up in my feed for a very long time. 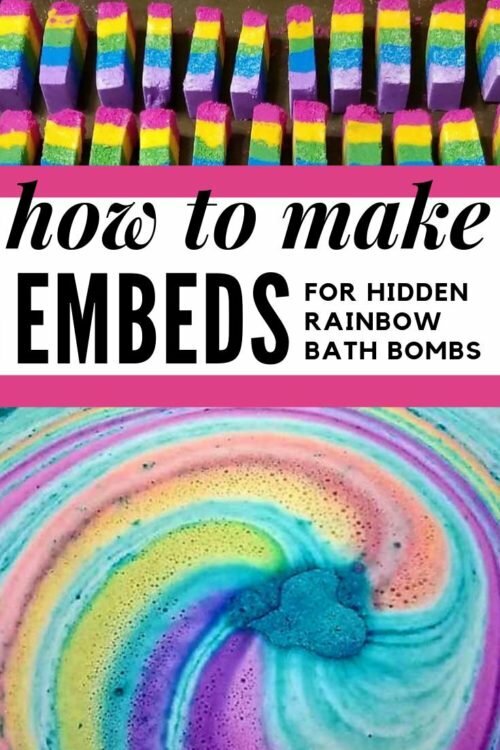 That purge was also how I discovered how to make rainbow embeds for hidden rainbow bath bombs. 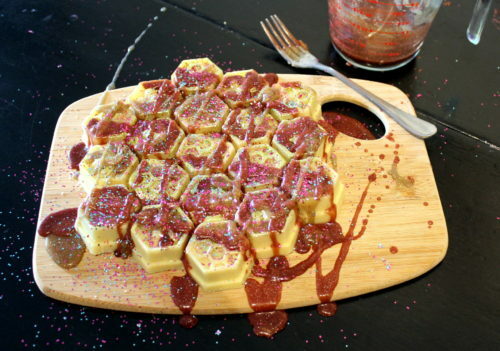 This rainbow bar embed recipe (and photos) come courtesy of Clerissa Jakubowski. 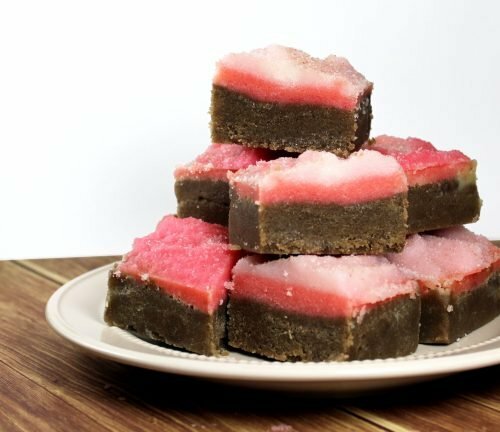 Not only was she gracious enough to share her recipe in one of the soapmaking groups I’m part of, she also gave me permission to share that same rainbow bar embed recipe with my readers. I won’t lie, her kindness made me feel all warm and fuzzy inside. And she helped remind me that there are still truly wonderful people in the world. People who actually want to help others without expecting anything in return. I hope you’ll show your thanks to Clerissa by giving her a follow on instagram. Or by supporting her future endeavors. 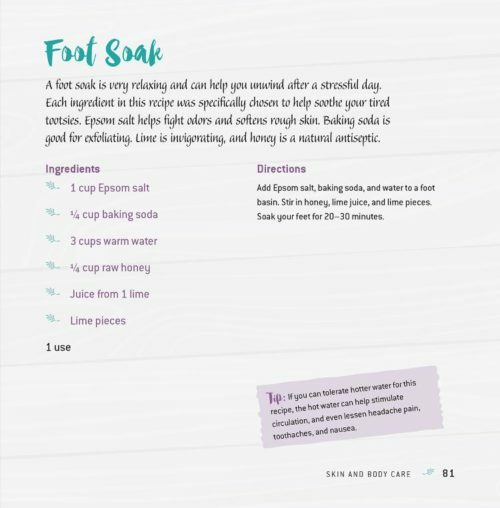 The SLSA has NOT been tested in this recipe yet. She was curious to see if it would result in a slower release with more foam. 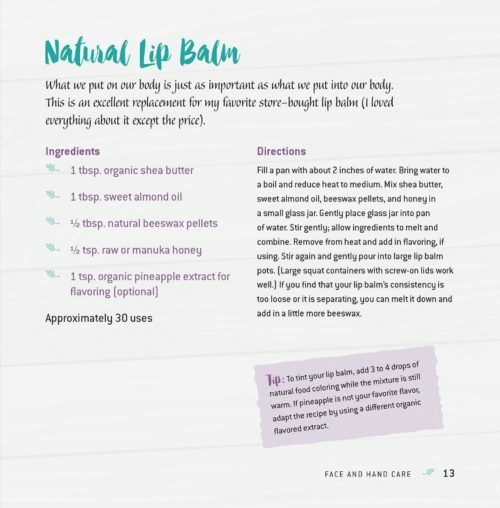 So if you try it before Clerissa has a chance, I’d love for you to share your results in the comments. 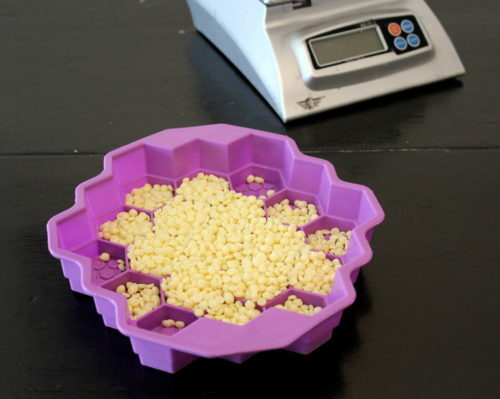 Additionally all measurements are by weight, with the distilled water being the only exception. 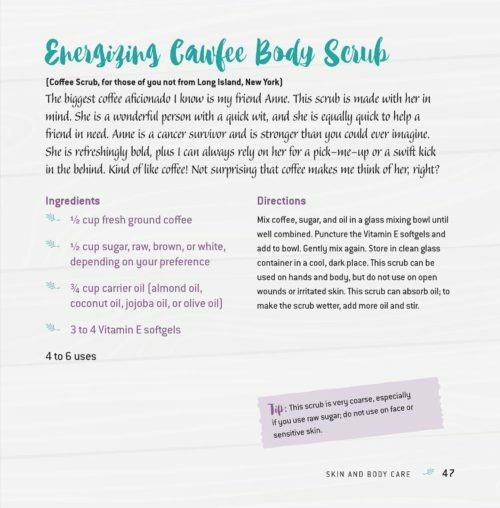 Clerissa also recommends inviting friends over to help with the embeds for your hidden rainbow bath bombs. 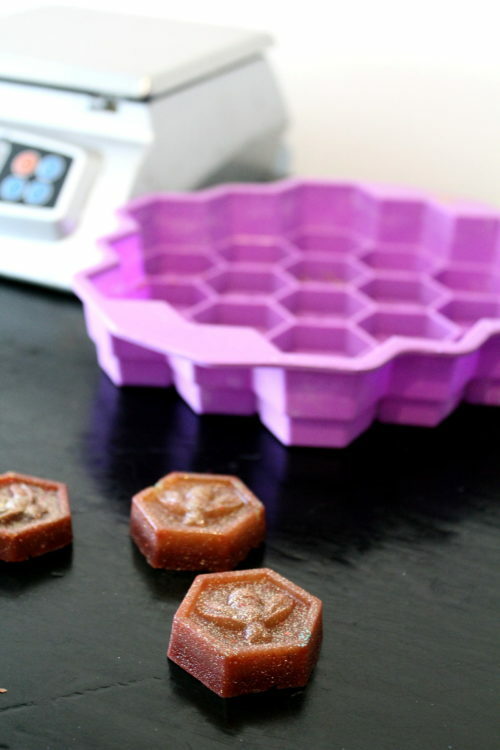 They can mix each color batch at the same time as one another to prevent premature drying. 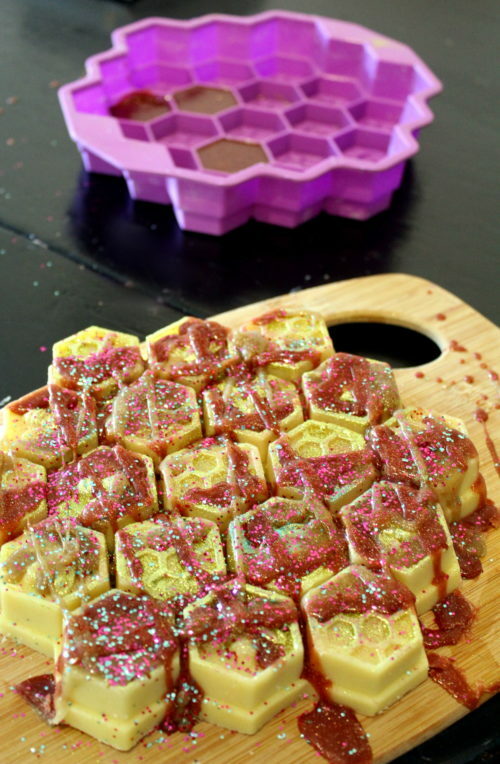 Alternately, you should wrap each color mixture for the rainbow bar embeds in plastic film wrap as they are made so they don’t dry out before going into the mold. #1. 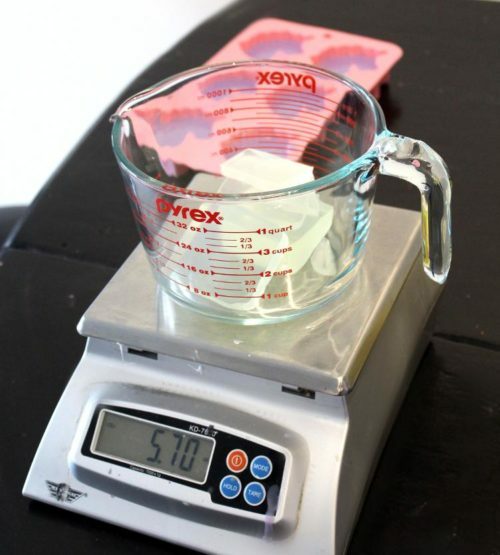 Using a scale, weigh out the baking soda and cream of tartar. Sift the baking soda and cream of tartar into a bowl. Set aside. #2. In a separate container, thoroughly mix the EZ color with water. #3. 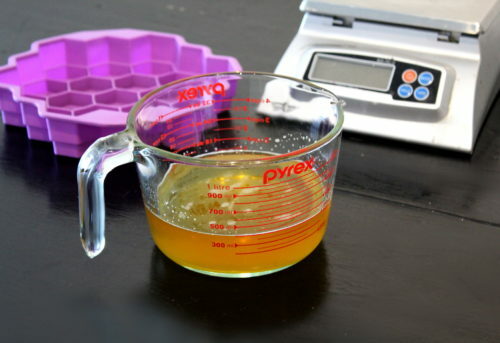 Now combine the glycerin and the oil of your choice together in another container. 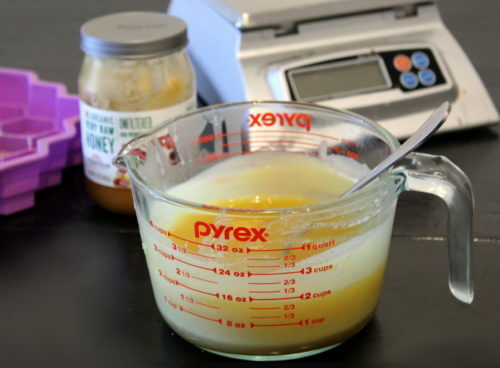 Mix to combine, then add the oil and glycerin mixture to the EZ color. Mix well. #4. 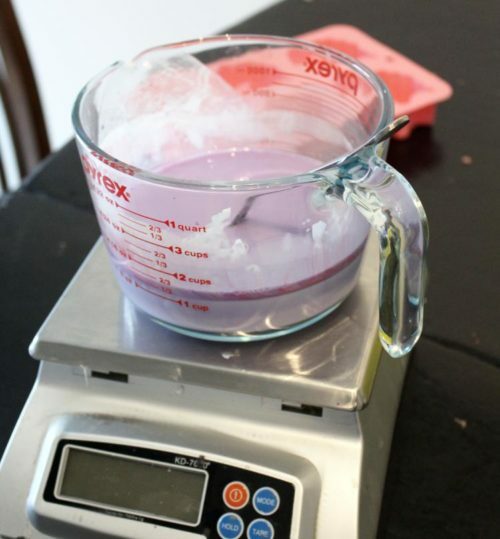 Add the EZ color mixture to the container with the baking soda. Then mix thoroughly to bring the color out. #5. Allow the baking soda and EZ color mixture to dry. #7. Now spritz the mixture twice with 99% isopropyl (rubbing) alcohol. Mix thoroughly, then conduct a drop test. If the clump doesn’t hold together when dropped, then repeat the process until it does. #8. Place the embed mixture for your hidden rainbow bath bombs. To create the rainbow bar embeds for your hidden rainbow bath bombs, you’ll need to make five batches of the above recipe – one for each color. Here’s how it’s done. #1. Mix five color embeds (red, yellow, green, blue and purple) in separate bowls, using a different bowl for each color. # 3. 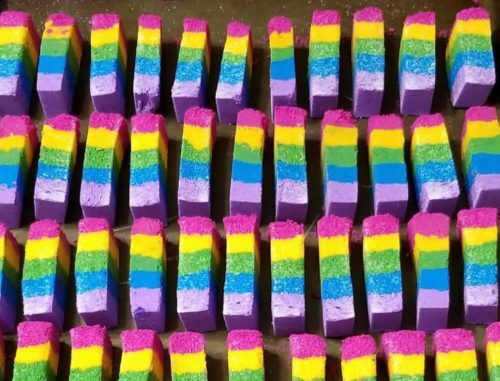 Allow the rainbow bar embeds for your hidden rainbow bath bombs to dry for 30 minutes. #4. 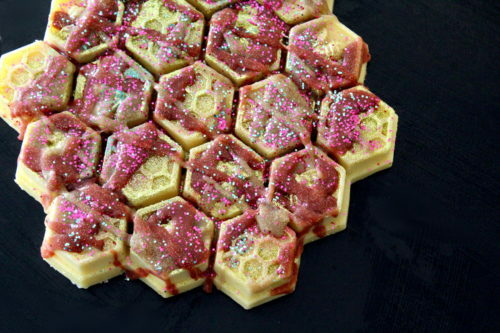 Very carefully unmold your rainbow bar embed. Then cut the bar into slices. Be careful not to squish the bars. #5. 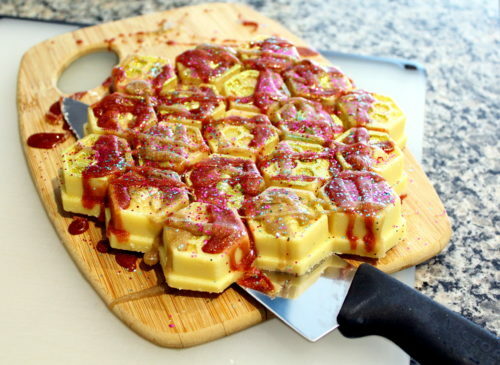 Now cut the slices you just made in half. 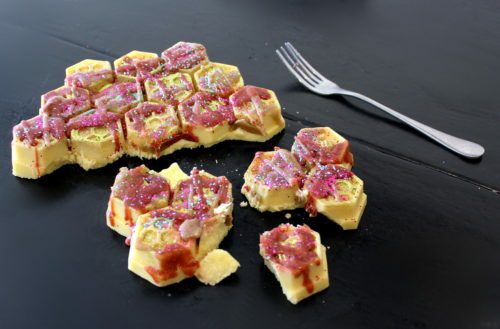 Then cut them in half again so you get four rainbow bar embeds per slice. #6. Allow the rainbow bar embeds to dry overnight. 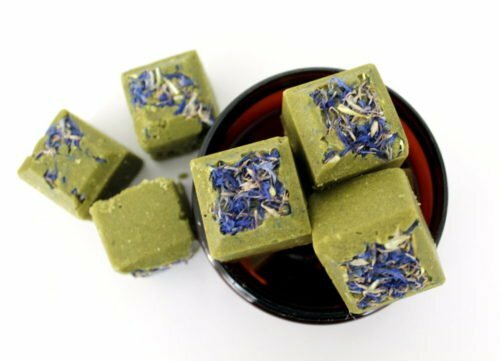 At that time, they are ready to be incorporated into your hidden rainbow bath bomb recipes! 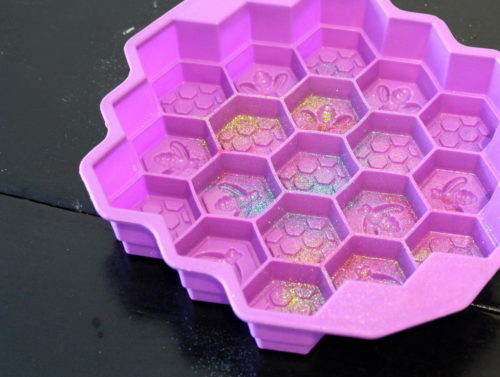 To do this, simply place an embed inside of your bath bombs when you are packing them into the mold. 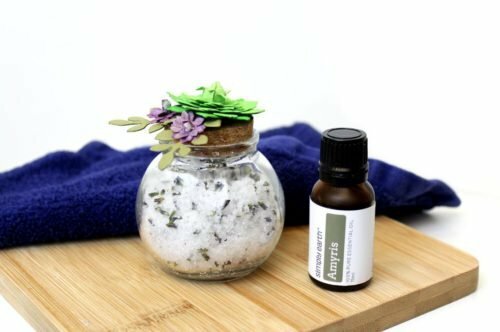 Following you’ll find a few homemade bath bomb recipes you make. Try one of your rainbow bar embeds inside to create fun hidden rainbow bath bombs! 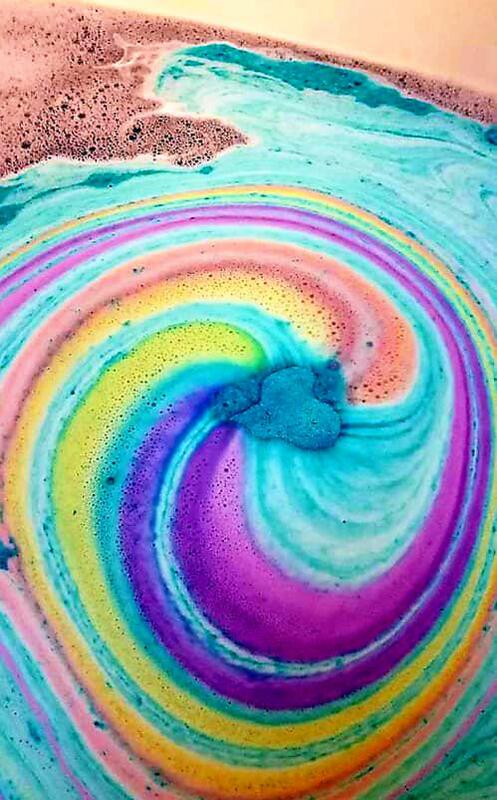 Not quite ready to make your own hidden rainbow bath bombs? Shop from these handmade artisans instead. 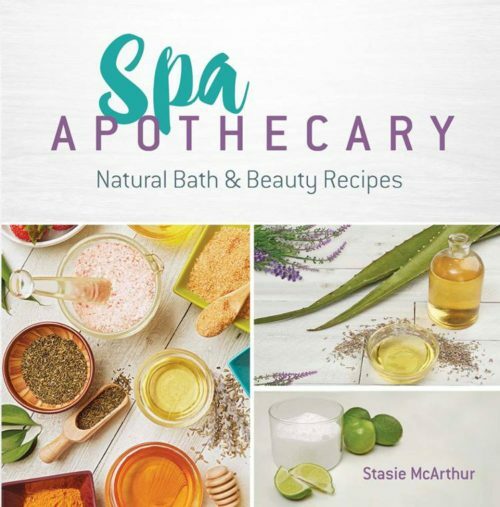 For more homemade bath bomb recipes, as well as natural beauty and skin recipes, be sure to sign up for my semi-weekly email newsletter. You can also follow me on Pinterest, twitter, facebook and instagram.